There were several movies which came into my consciousness during my formative high school years which fed my desire to be a writer, or at least, to be involved in creative endeavors for as high of a percentage of my life as possible. These films include PULP FICTION, THE USUAL SUSPECTS, WHEN HARRY MET SALLY, and certainly GOOD WILL HUNTING. 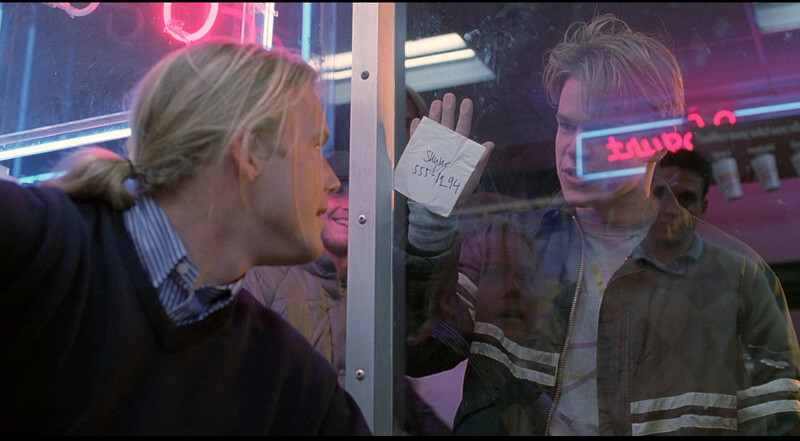 I watched GOOD WILL HUNTING (1997) on 12.2.09. I’ve probably seen this film 20 times, though this was my first viewing in at least five years or so. Gus Van Sant did a lot of things in this film which would have been unnecessarily cut if this was released ten years later. He allows moments of quiet to occur where modern films tend to discredit and remove these ‘time-wasters’. He focuses on seemingly small characters (like the TA, or the bartender) whose simplicity help accentuate the genius of its major characters. Matt Damon, Stellan Skarsgard, and Robin Williams are all brilliant minds in their fields, though they embrace it in different ways. Damon wastes and shields his talents, save to get a girl or to fight for the honor of his friends. Skarsgard embraces and flaunts his, at times to get a girl or fight for the honor of himself. Williams accepts his and somewhat rejects his, and is happy to share his knowledge as a teacher of a community college. For each of these characters, however, their minds are also the reason for each of their respective social deficiencies. Damon is abusive and abrasive, Skarsgard is ego-maniacal and impatient, and Williams is disengaged and complacent. The story goes that Damon and Affleck would drive across the country en route to auditions and tell stories to keep each other awake. They’d make things up as they went, and write them down when they had a particularly good one. That lead to the anecdotal and joke-filled nature of the script. It was full of potential, but also lacked narrative drive. Enter William Goldman (who wrote PRINCESS BRIDE and BUTCH CASSIDY…) who came in and did an uncredited clean up of the script. The movie came out, and now we get to see Affleck and Damon credited as Oscar Winners, even if they didn’t get it for acting (though Damon deserved one for this performance). ~ by johnlink00 on December 2, 2009.